Ending it's run at The Music Box tonight is David Gordon Green’s Prince Avalanche. It’s the director’s eighth film and the popular discourse surrounding the film is that it is a “return to form” for Green. I’m resistant to the phrase, not so much because I take umbrage with any of Green’s work (as I avoided his post-Pineapple Express output) but because the guy still seems to be developing a form to begin with. Not to fault his masterworks (George Washington to Pineapple Express, are of considerable merit), but there’s certainly a sense that he’s only scratching the surface of what he can do creatively. Another director who began his work in the aughts and enjoys a measure of notoriety is Edgar Wright. Already designated by some to be one of the best comic directors working today (a claim that I happily stand by), his varied work in several genres is unrivaled – made ever more impressive by the fact that his debut came in 2004. The World’s End opens this weekend in semi-limited release. Now that my ten minute cycling commute has changed to a two hour bus/Metra/bus ride, I’ve been afforded the absolute luxury of listening in on people’s conversations. Attempting to make the best out of a new (i.e, lousy) situation, I figure that time spent on the train could be best used toward my writing. And as a plus, my various eavesdropping might actually serve as blogger fodder. So when I heard a couple of business analysts converse on my work shuttle about Argo, my ears perked. Killer Joe is a picture that is so entrenched in its own male bravado and it is a minor miracle that I was capable of responding to any of its other qualities. But what allows Killer Joe to succeed beyond its visceral qualities is its ability to acknowledge the ugly open space of its environment. As William Friedkin opens with a view of lightening enveloping the night sky, we understand that the ugliness of the environment breeds those of a darker origin. The people found in this film are not of the pleasant variety. They are all cold, restless, lazy and above all, stupid. What we get out of this film is something of a peek at their final transgressions. 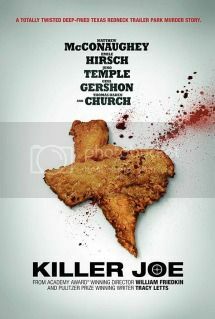 Killer Joe functions as a taut and riveting example of how a dark world can produce a perpetual state of cruelty. Much to the film’s advantage, Tracey Letts’ screenplay lays out a simple narrative framework to follow. Stupid people scheme murder to pay off gambling debts. They enlist a hitman named Joe (Matthew McConaughey, who has had his best year yet, with Jeff Nichols’ Mud still in tow). The job is the red herring to getting these characters in the same place at one time. As a result of his delayed payment, Joe accepts a retainer in Dottie (Juno Temple) – the contrast between the two is obvious from the beginning. She’s the angelic trailer-park trash dressed in white, whereas Joe is the outsider, dressed in black, where every movement carries a sense of purpose. Dottie’s acceptance of a darker state of things coincides with Joe’s suave sexual coercion. As one can expect, dimwitted schemes tend to breed dimwitted results. This is where Killer Joe rejoices in its candor and appetite for the distasteful. Friedkin employs a bit of Sam Peckinpah, a dash of Tennessee Williams and a sprinkle of John Waters in a bombastic final sequence that acknowledges the inhumanity of every character’s life. Certainly relishing in pushing boundaries, a valid argument can be made against Friedkin’s overt use of violence and flagrant misogyny. I tend to be turned off by pictures that adopt such cynical worldviews, but Killer Joe, intentionally or not, seems to operate in a world outside our own. With such wide-open vacant spaces, trailer parks lit by trash-can fires, and a world populated by the selfish, what we see in Killer Joe is less a glimpse of life as we know it, but rather, a glimpse of Hell on Earth.